Technical command coupled with mellifluous voice, that’s what makes Pandit Rajan and Pandit Sajan Mishra’s music divine. 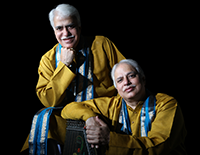 Born into the family of great maestros of Banaras Gharana, the brothers have set high standards of excellence in performance and presentation. Their tours to U.S.A, Europe, Singapore, Sri-Lanka and Middle-East and performances at Royal Albert Hall, London and Lincoln Centre, USA, have been huge success. They have been honoured by Padmabhusan, Kumar Gandharva, Sanskruti, Sangeet Natak Academy, Sandeetratna awards and many more. Currently, Rajan and Saajan Mishra are taking the traditional guru-shishya legacy forward at their Gurukul at Dehradun.